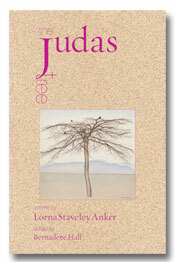 I just realised I have two copies of The Judas Tree by Lorna Staveley Anker (see my post here). I bought a copy and then got sent a review copy. Next Friday I will pick a follower of Poetry Shelf to send to the spare copy to. This entry was posted in Poetry on August 30, 2013 by Paula Green. Bernadette Hall has edited The Judas Tree, a selection of poems by Lorna Staveley Anker (1914 – 2000). The book also contains a detailed bibliography of publications, chronological autobiographical notes and an introduction by the editor. This poet was unknown to me and I was grateful that she was not only brought to my attention, but that I was able to place her poems within the context of her life and times. Having just reviewed a novel for The NZ Herald by an Italian author (Elena Ferrante) who insists on absolute anonymity, I have been musing on the usefulness of authorial contexts. Since Roland Barthes’ provocative ‘Death of the Author’ essay decades ago — and truckloads of theory on the role of the reader and the performance of ‘texts’ — I think it is very clear the author is not the sole authority on what is written/published. If we remove ‘authority’ from the cult of the author, then we might be left with authorial context (autobiography, social and cultural times, opinions and so on). Thus, I welcome with open arms access to such details — along with a vital conversation on the practice of writing and reading fiction and poetry. So a brief author context: Lorna was born in Christchurch. When she was two, her father died from throat cancer and her mother took in boarders to support the family. The mother’s grief was amplified by the death of her three brothers in 1918. Her mental state affected Lorna. Lorna married a fellow teacher, had five children and began writing and publishing in the 1960s. After the death of her husband, she became more public as a writer, with poems appearing in numerous journals and magazines. Her debut collection appeared in 1986, My Streetlamp Dances, with two more to follow. Lorna writes in an essay on women in wartime, ‘I am a war casualty.’ She suffered from night terror, agoraphobia, anxiety, panic attacks, and in her final years, Parkinson’s Disease. Bernadette concludes the book with a moving set of acknowledgements — above all, to Lorna herself: ‘if she hadn’t been such a beautiful presence; if I hadn’t been invited to speak at her funeral; if I hadn’t suspected that the subversiveness of her conversation might be reflected in some hidden-away manuscripts; if she hadn’t brought up her daughter to be as fearless as she herself was, this book might never have come into existence’ (106). Lorna’s poems reflect a mind that engaged with the world acutely, wittily, compassionately. There is a plainness to the language in that similes and metaphors are sidestepped for nouns and verbs. These are poems of observation, attention, reaction, opinion, experience. The starting point might be the most slender of moments — and the poetry opens out from there, surprisingly, wonderfully. In the first section (and indeed the largest section), war makes its presence felt; from the pain of departures, to the pain of the wounded, to the ache of loss. At times Lorna filters a poem through the eyes of her young self (for example, trying to make sense of Armistice Day). At times a concrete detail makes the poem more poignant (‘her spade searching/ her garden for/ her three lost sons’). In ‘Arie’s Tale’ the detail that renders the pain sharper is the ‘tyreless rims.’ In this poem the dead are carried away on a bicycle that makes such a clatter it is the hardest thing to bear (‘He felt it wasn’t respectful/ to his customers’). Lorna’s war poems stretch in all directions — they never forget the life that goes on and they never forget the heartbreak and loss that are etched indelibly. One of my favourite poems, ‘V.E.Day … and Neenish Tarts,’ moves beautifully between these two opposing but entwined forces. From the darkness of battle (now over), the poem moves to the grandmother dancing on the bed (as warm flesh weaves/ pink circles/ under a nightgown’; and from there to ‘Let’s have Neenish tarts for tea’ (this is cause for celebration). This first section of the book is a terrific addition to New Zealand war poetry because it casts a light on women at war (even when they remain in the kitchen). The remainder of the book shows that Lorna is more than a war poet. Her sense of humour is there in the dance with a tea-cosy upon her friend’s head. There is the recurrent political edge that marks a mind roving in the world (‘Every headline is grit in the eye’). There is the slight surrealness of the the house in Lyttleton that swells every night, ‘Since they widened the road.’ There is the stepping around poetic corners to re-view the facts or first impressions (The company agent (her father) collected all the statistics in his diary but would you guess ‘the uplands and plains/ of early Canterbury ever/ yielded beauty, colour, form’). Lorna’s collection is a delightful discovery. Her poems never sit still (do any?). They take you to grief and yet to laughter. Their linguistic simplicity is a gateway to a rich, reading experience. I am very grateful. The editor Bernadette Hall is to be congratulated on bringing these poems to a wider audience. Bernadette lives at Amberley Beach in North Canterbury. She has published numerous collections of poetry including The Lustre Jug, and edited Joanna Margaret Paul’s Like Love Poems: Selected Poems. She was a judge for this year’s New Zealand Post Book Awards and co-founded the Hagley Writer’s Institute in Christchurch. This entry was posted in Poetry and tagged Bernadette Hall, Lorna Stavely Anker, NZ Poetry reviews on August 30, 2013 by Paula Green. Thanks to Seraph Press I have selected a follower of Poetry Shelf (out of the hat) for the giveaway copy. 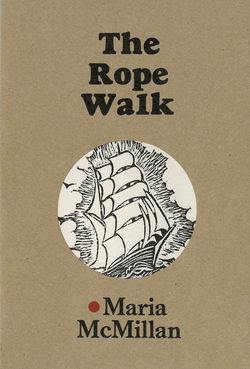 Maria McMillan’s The Rope Walk goes to Emma Neale. This entry was posted in Poetry and tagged Maria McMillan, Seraph Press on August 30, 2013 by Paula Green. How do contemporary poets engage their multiple audiences? What is the function of experiment in writing as a social act? How should we map the cultural dimensions of eco-poetics, identity politics or non-normative behaviours? Seven speakers address these and other questions in a series of interactive panels and a public reading hosted by the NZ Electronic Poetry Centre (nzepc) in conjunction with Australian poet Pam Brown’s Distinguished Visitor Award at the University of Auckland. Our speakers are Adam Aitken (Sydney), Ali Alizadeh (Melbourne), Pam Brown (Sydney), Jen Crawford (Singapore), Ya-Wen Ho (Wellington), David Howard (Dunedin), Susan Schultz (Honolulu) and Ann Vickery (Melbourne). We welcome students, staff and interested individuals to this free event at the Pat Hanan Room in Arts 2, 9 am-4.30 pm. Then join us at Auckland Central City Library and hear symposium poets read their work at WORD AND WORLD, 5.30-7 pm. . This entry was posted in Poetry and tagged Michele Leggott on August 30, 2013 by Paula Green. 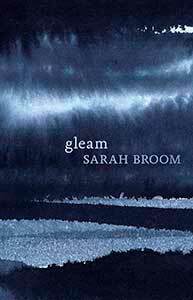 Having just posted a tribute to Sarah Broom, I now have permission to post one of her poems: ‘holding the line.’ Picking a poem from her new book, Gleam, was no easy task. In the end I picked the poem that opens the book, an entry that unfolds upon the page like an origami bird. It takes flight. It trembles, hovers, and shimmers with meaning and music and tiny little freedoms. This is a poem of utter economy, every word poised and perfect in its location and resonance. The lines sound out with exquisite music, each musical note, a chime for the ear. There is the homely gesture — a gesture that signals self care (the full moon placed on the brow). There is the way the moon shining bright and cool in the night sky is an object of beauty in which to restore oneself. There is the quiet hint at the moment of despair (‘my heart/ is clapping out of time’). There is the extraordinary leap of imagination that is a leap of fortitude (‘I take it out/ and throw it among the stars’). There is the depositories of wisdom (‘who know all there is to know’). Reading this line in the context of the book and the context of Sarah’s life, I see this as holding onto the thread of existence, the ticking heart beat, the line that leads faintly, beautifully to a moon or to the ‘drag of the sea’ or to the arms that embrace her. It is the line that is an anchor, the blood line that is family and loved ones, it is the line that is the line and length of friendship. Above all, and movingly so, it is the line that the poet inscribes in her notebook and then wings through the air to a reader. It is the line that makes poetry — that the poet held close and then let go for all to see. This entry was posted in Uncategorized and tagged poems, Sarah Broom on August 27, 2013 by Paula Green. Saradha Koirala’s second collection, Tear Water Tea, arrived in my post-box in style this week. It was wrapped in blue tissue, with a tracing-paper tag embossed with with a bee. Imagine if all poetry books were delivered to us like this. The book, itself, is beautiful to both hold and behold. Delicate black & white drawings of flowers scroll about the powder blue — and then you shift from skull to lego block to bee to teapot (or whatever route your eye might take). David Randall Peters, the artist, also did the faint, vein-like, pool-like drawings scattered inside. Saradha’s new book flutters between the physical world (a land-locked bird, an escaping dog, a sheetless bed) and a more ephemeral world (blown kisses, things in the air, melting photographs, smoke, ink tears, vapour). What emerges in this poetic movement between what is observed physically, intuitively and at times unfathomably are the strong and lyrical threads of love, home, and place that glue the collection together. It is as though the poet is inviting us into her family album, a poetry diary of sorts, and each poetic entry is lovingly crafted. While much of the collection adopts a quiet, almost conversational tone (back to Andrew Johnston’s notion that much of New Zealand poetry is talky), the collection as a whole offers the variations of a musical piece. Certain phrases ring deliciously in your ear (‘colourless in corners and stiff’ ‘I pull my temper’). Analogies surprise (‘and yet months pass like clouds’). In some poems, the words accumulate in lush patches of alliteration and assonance (‘Arat’). Then there is the way everything comes together in the one shimmering line (‘no need to read the residue/ of forests strewn like tea-leaves on the lawn’). The opening (and title) poem is a delight (‘Tear Water Tea’). It lays down three slender strands within its slender form, and you cannot help but swim through the gaps. Poetry so often comes alive out of juxtaposition. Here, storytelling is placed next to grief which is placed next to daily routine. There is accruing mystery about the boy and his imagined wolf, a story that gets repeated in order perhaps to dislodge grief. There is the rip that is also sorrow, that a cup of tea might wash away (there, there). There is the kettle put on — oh, the salty tears that masquerade for water — as you speak and as you listen. There is this strand collapsing into that strand, and so on and so forth. Poetry can take many forms and employ language in a thousand ways, but there is something immeasurably satisfying about small poems that are economical, graceful, mysterious (Bill Manhire is a whizz at this!). Thanks to the publisher and the poet I have reproduced the poem below. Saradha’s second collection is a larger version of the small poem that introduces it: pleasurable, contoured, refined. A little gift, indeed. a boy, an imagined wolf. As if sorrow can be likened to mischief. Saradha resides in Wellington and has taught English in secondary schools since 2005. She is of Pakeha and Nepali descent, and holds a Masters in Creative Writing from the International Institute of Modern Letters at Victoria University. Her new book was recently launched at the fabulous Quilters Bookshop in Wellington. Her debut collection was entitled Wit of the Staircase. See below for further links. This entry was posted in Poetry and tagged poetry rview, Saradha Koirala on August 27, 2013 by Paula Green. Sarah Broom (1972-2013) is to be honoured in a new poetry award thanks to her husband Michael Gleissner (Sarah Broom Poetry Prize). The award is a way of acknowledging the strength, imagination, craft, commitment and love that guided Sarah in both living and writing. The prize will enable a New Zealand poet to work towards the completion of a poetry manuscript. The entry will consist of 6-8 poems of which at least 5 must be unpublished. Entries will be accepted from 3 February 2014 and close on 28 March 2014. The winner will be announced May 2014. Sam Hunt is the inaugural judge and I am delighted to be a member of the judging panel. For further details see here. Sarah undertook academic studies at Leeds and Oxford which resulted in her publication, Contemporary British and Irish Poetry (Macmillan, 2006). 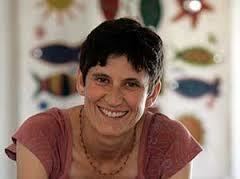 She returned to New Zealand where she held a post-doctoral fellowship at Massey University in Albany. An academic life, however, gave way to time dedicated to poetry, motherhood (three young children) and managing lung cancer. These three factors understandably became entwined — and her poetry is testimony to a woman who nourished the word along with her family and her self. 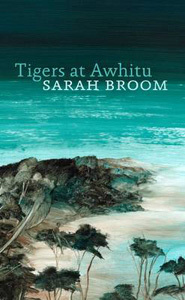 Her first collection, the astonishing Tigers at Awhitu (Auckland University Press, 2010), is a book of two parts. The first part was written before her diagnosis, while the second part was written afterwards. Poetry is at work in both. As you move through the poems your ear is lit by the musical notes, you are drawn into the detail that enlivens a view of the physical world, and captivated by miniature renditions of life and experience (‘The beach is heaped and hilled with bleached branches/ as if whole forests have been rolled over the ocean/ and dumped.’) (And: ‘It was as the snow started falling again/ that she blurted it out, so they were all/ just standing there gazing up, knee deep/ in snow’). ‘The poems, that may in part be therapeutic, stand as an aid to life. Things outside the clinical procedures and walls wrap about her as windows, anchors and safety nets. Reading these poems, the real world fades to a distance, and beyond the tender craft of each line, the intense luminosity of each word choice is poetry of absolute love.’ For the rest of the review see here. 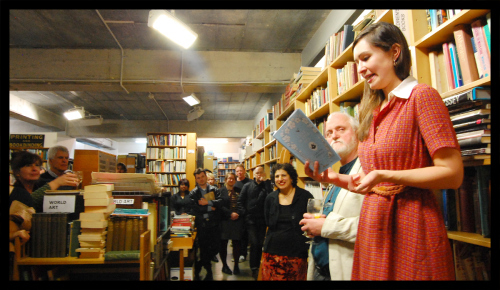 Sarah’s second poetry collection, Gleam (Auckland University Press, 2013), was launched posthumously. In my review in The New Zealand Herald, I wrote that: ‘Broom uses big things such as the stars (“I am so thin/the stars can see right through me”) and the ocean to navigate lines that shimmer with little explosions of loveliness.’ These poems come from a tremendous love of writing and of family. The poems uphold the musicality and the attentiveness that marked her debut collection (‘So I lay there every night/ and every night the fat white/ moon crept out of the bush/ and came to talk to me’). They are poems that signal the way craft can produce joy, yet upon each occasion there is the fragility of life, the preservation of all that matters, the ability to shine beyond pain and bitterness (‘you are both held/ and not held’). Such poetry becomes a gift to the reader – a place to enter and re-emerge subtly changed. Reading this book strengthened me. Two of the love poems here were published in Dear Heart; love poems that stretch beyond petty squabbles to those bonds that forge immeasurable intimacy. I could never read these out at a reading, but readers have commented on how these poems stick with them. I love writing about poetry but I want Sarah’s poems to resist my dissection. I want these poems to stand and endure, each and every one, as little homages to love, life, difficulty, family and the insistent desire to write. Each poem holds the world at arm’s length as you read — and then draws it in closer. Perhaps writing and reading under the threat of death does this. Ever since my theoretical explorations for my doctoral thesis I have wondered if writing is a way of postponing death. If you write your way into life. I don’t know. Sarah’s Gleam is a gift for those of us who are well, and those of us who are not; for those of us who write poems and for those of us who love to read them. This entry was posted in Poetry and tagged Sarah Broom on August 25, 2013 by Paula Green.